When we picked up beets at the farmers markets, I take them home and cut the beets from the greens before storing them since this will help them last longer. But, I don't throw away those greens. To us, those dark, leafy greens are as much a treat as the red jewel at their roots. Did you know they are basically the same thing as rainbow chard? We like then sautéed as a side dish, thrown in soups and stews and stir-fried. This is an earthy, hearty salad with a hint of smokiness from the cheese which makes it perfect for a vegetarian main course. It's colorful with lots of textures. I especially liked how the cubes of smoked mozzarella became just a little runny and stringy from the heat of the rest of the ingredients. It would also make a a wonderful side dish with a grill steak. 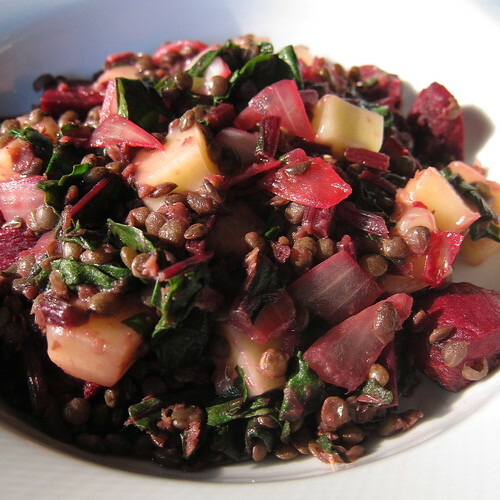 We used lentils du puy when we made this salad because we love their texture and flavor. They can be rather expensive and harder to find here in the States. We picked up a few pounds in Sweden because they are so much cheaper in Europe. They'll be one of those things we pick up every time we travel. Anyway, You can use any lentils you like. We used beets that were roasted ahead of time for this salad so, keep that in mind when making it. Cook the lentils according to their directions, drain and set aside. In a large skillet, heat the olive oil over medium-high heat. Add the onions and garlic and sauté until the onions are tender. Add the beet greens and stems. Sauté until the greens are very wilted, they will reduce in size a lot. Stir in the roasted beets until heated through. Whisk all the dressing ingredients together until the salt in dissolved. Mix the cooked lentil into the vegetables. Dress with as much dressing as you like. Stir in the mozzarella cubes. Makes 2 main dish servings or 4 side dish servings. I love those greens, too. Steamed, stir-fried, or braised. Happy to discover you today via Elle. I have to learn lentils though ;-). I remember a farmer at the Farmer's Market telling me - rainbow chard is just a beet without the beet. Ha! A beautiful dish! I love lentils and beets together, I add some green onions in there and it is my favorite lunch!